The "Melissa Firm" is a King Koil Mattress that is built not only for an initial firm feel but for a long-lasting level of comfort and support. 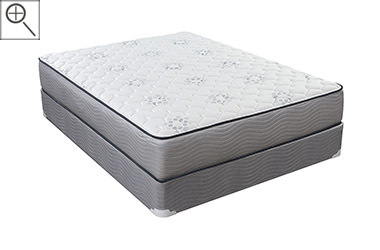 In its price range, there aren't many (if any) mattresses out there that offer: dual insulator pads, Orthopedic Foam, Firm Poly Foam and Firm Support Foam; all in the same mattress! Add to that its Superlastic coil and you're getting the most comfortable durability that you can experience from a low cost firm mattress model. We recommend this mattress for anyone seeking a firm mattress (not so much in the extra firm, brick-like range) and who is looking for a lot of great nights' sleep for their buck. Made in Michigan, USA of CertiPUR-US foams. Despite its relatively low price, the "Melissa Firm" has many elements of a sturdily built firm mattress and appears to be built to not only sleep well, but to last. Not every manufacturer adds certain 'touches' to their moderately priced models but King Koil does! Two Spinal Guard Insulator Pads keep your foam from dipping into your spring. There is not only the customary layer of poly foam near the top of this bed but there's also a deeper Firm Support Foam and Firm Orthopedic Foam. All of this is stacked upon a strong, long-lasting and body-contouring SuperLastic Continuous Coil system.